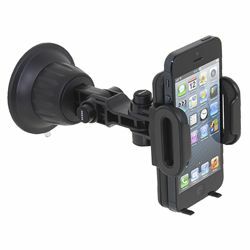 Keep you phone, MP3 device or GPS device firmly in place with Satechi's dash/windshield adjustable suction cup clamp. The two joints each rotate 180 degrees, but only when you press and hold the adjustment button. The device clamp squeezes tightly but releases with the touch of another button. Fold-out clips, a hand-tightened suction adjuster and a 360-degree swivel give you even more security and options. Fits all handheld devices up to 3 3/8" (85mm). Includes cleaning pad and sticky dash pad. Phone shown not included. Please note, applying devices to windshields is illegal in some jurisdictions.